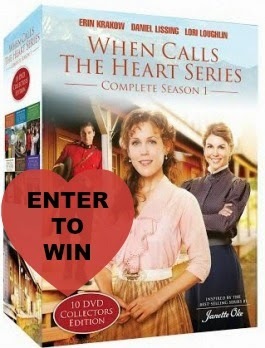 Have you seen the Hallmark Channel's Original Series, When Calls the Heart? Well, if you missed Season One, be sure to tune in THIS SATURDAY April 25th at 8/7c to check out the 2 Hour Season Premiere! I was fortunate to get a sneak peek of this premiere and it's not one you want to miss! Even though I have not yet seen Season One, I didn't feel like I was lost or confused watching the premiere of Season Two. They gave a great recap and it was easy to jump right in and fall in love with the characters. 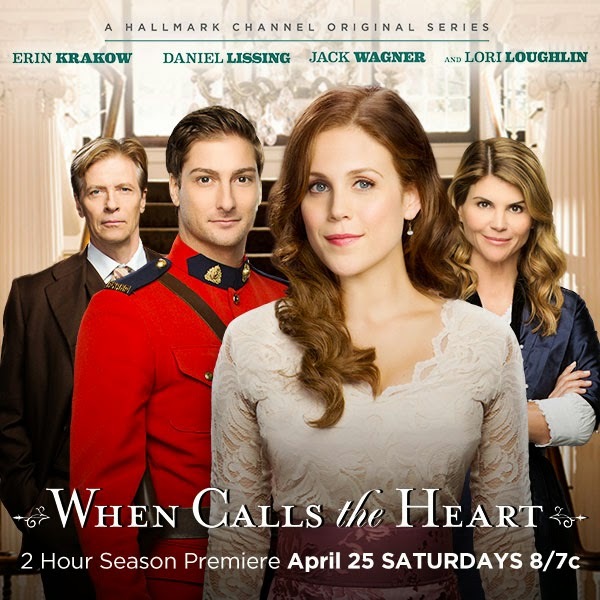 As a blogger with Flyby Promotions, I was able to be a part of a LIVE phone interview with actress Erin Krakow who plays Elizabeth in When Calls the Heart. It was a tremendous blessing to be a part of this interview with Erin and other bloggers! She certainly sounded as sweet and kind as the character that she plays on the show. She certainly is quite likable. When asked if she thought there were are similarities between herself and the character she plays, she said she hoped so! Both are driven, passionate and followed their dreams. Both appreciate the great outdoors and learning new things. Even though Erin didn't grow up in a large mansion as Elizabeth did, she did have a time adjusting from moving from Florida to New York City to pursue her acting career in college. She saw the similarity here in moving to a new place as Elizabeth had to when she moved from her wealthy home to Coal Valley. When asked why she took the part of Elizabeth, she simply answered, "They offered it to me and I said yes." She continued to share that she looked forward to having the chance to play in a world different than her own and working with kids. It was one of the best decisions she has ever made! The most rewarding aspect of working on the set of When Calls the Heart has been seeing how the fans have responded to the show. Since this is a family-friendly show that parents can share with their tween and teenage girls, she hopes that young ladies will take away from the show how to lead with kindness, follow your dreams and not to let fear guide you. This series is based on the book series by Janette Oke. Erin was able to meet the author last season. Janette Oke came and visited set and made everyone in the room feel important and special. She went around to every one of the children there and made sure to say hello to each one! What I gathered from this interview is that Erin Krakow has a sweet spirit and a soft spot in her heart for children! The Hallmark Channel Premiere on Saturday that she stars in shows a kind and generous Elizabeth, a character that Erin fits into very well. Watch this weekend and see what happens to the widows of Coal Valley who lost their husbands to a terrible mining accident. There are plenty of surprises, twists and turns and of course, romance! I want to win because this show sounds like something I would really enjoy. This would be great to watch. I don't have cable or any pay for view programs. We are always looking for something to watch. We do have an antenna on the roof and I get 3 local stations. I'd like to win because it sounds like an interesting show. I don't have cable or satellite so I wouldn't be able to see it otherwise. I want to win because it looks like a show I can watch with my teenage daughter that we will both and enjoy.